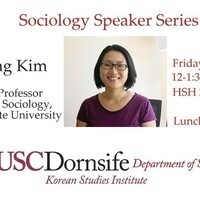 The Department of Sociology, with co-sponsorship from the Korean Studies Institute, brings a talk to USC by San Diego State University Professor, Minjeong Kim. Based on ethnographic fieldwork, Minjeong Kim examines Filipinas who married rural South Korean bachelors in the first decade of the twenty-first century. Against a backdrop of the South Korean government’s multicultural policies and projects aimed at integrating marriage immigrants, Kim provides a nuanced understanding of both the conflicts and emotional attachments of their relationships with marital families and communities. Her close-up accounts of the day-to-day operations of the state’s multicultural policies and public programs show intimate relationships between Filipinas, South Korean husbands, in-laws, and multicultural agents, and how various emotions of love, care, anxiety, and gratitude affect immigrant women’s fragmented citizenship and elusive sense of belonging to their new country.